I'm listening to Coverville's podcast, an all-Kate Bush show. Why do I no longer own any Kate Bush? Specifically, why don't I own Hounds of Love? I have family a good day's drive away, and they will be celebrating this weekend. So I will go and celebrate with them. Friday will have me driving toward my family. Monday will have me driving away from my family. My route to this gathering puts me as going through La Crosse, Wisconsin. Which is the home of one of the better guitar stores in the Upper Midwest (or so I'm told), Dave's Guitar. It has been negotiated. I will be visiting Dave's Guitar. I plan to drool over things. I plan to take bad phone-pics and blog about them. I plan to play something cool. I haven't planned to find something to do in La Crosse that my wife, who really doesn't love guitars, or my six-year-old, who isn't always patient, would want to do. But I figure I should do so. Is there anyone here familiar with La Crosse? Anyone have any ideas? I have a Pee Wee Les Paul. I have a nut extender. Now I have a guitar in open G. That is, open G as if it was open D and capo'd up five. GDGBDG. It's a Pee Wee, built for the little ones, and the little ones have never taken to it. So, it is my lap steel #2. This makes me think about tuning. The standard guitar tuning is a bit of a mess. Scales lay out beautifully when you tune in fifths, as any mandolin player will tell you. It's hard to see the parallels and overlaps when you tune in fourths, like guitarists do. And then there's the bump, the major third between the second and third strings. Or fourth and fifth strings. It works. It makes chording fairly easy. Easier, I say, than in fifths like a mandolin, and as easy, in a different way, as everything put out in front of you with a keyboard. Richard Lloyd describes the tuning as coming from a pre-decided use of an E as the low string and fourths and trying to find something more useful than the C and F resulting. It is a reasonable take, and as a "here's why, now go away" explanation, it works as well as any other and better than most. But it doesn't compel me. It sounds like a maker came up with a problematic design (EADGCF) and eventually a compromise (EADGBE) came about. It starts with E, but the E bass string is probably the last string added to the modern guitar*, and thus it makes it unlikely that the tuning started with the deification of the E.
* The low B string, actually, is the last string added to the modern guitar, and it's still not universally accepted. But it is used for the same reason the E was at first, to give a deeper ringing bass note there. Bob Brozman argues for the centrality of the G tuning (DGDGBD), saying that's the first open tuning every guitar goes for. Not just "Open G", but that tuning specifically. That tuning shares a G chord - D G B - with standard. Other stringed instruments, like the ukelele and the banjo, share a standard open G, although one might wonder if there is a standard banjo tuning, and the other members of many bluegrass bands wonder aloud if you can tune a banjo and how could you tell if it was tuned. So, is the G-B third a compromise, or is it built in? What's your take? And, incidently, if I say the sixth string, which string would you count that as, the high E or the low E? I am in Hardware Heaven. Almost. We have four new laptops and docking stations that will do good and useful things. When I get admin privileges. We have three new desktops which I will configure with two specialty cards of one type and one specialty card of another type. All PCI. Except the specialty card of the first order takes special cables. Which I don't have. And the specialty card of the second type was sent to us as PCMCIA. Not easy to make them work with desktops. Plus, no video cards, and no video on the motherboard. So, I'm unable to really do what I need to. 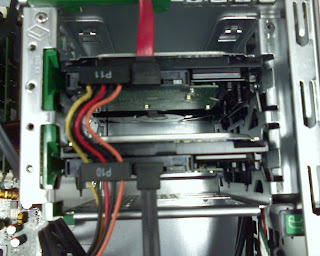 And we have spare hard drives to back up the main hard drive. SATA. Might I take this moment to mention that SATA is the coolest thing, a far better interface than the wide ribbon cables of IDE and SCSI. Installed HD: 250GB. Biggest hard drives I have ever held in my hand. Backup HD: 80GB. Not bad, but that could make a dd difficult. Might I add: If we can decide on a good angle for SATA cables and stick with it, I'd really appreciate that. But still, shiny new machines, shiny new monitors, and I don't have to take a drill to any rivets to make anything fit. So, I was reading this blog about people driving through Chicago too fast. Specifically, "Speeding on LSD" was a phrase that I read. I thought that meant lysergic acid diethylamide. That struck me as a particularly dumb thing to do, but that doesn't mean people don't do it. I didn't take it as meaning Lake Shore Drive. If you read "drivers on LSD", what would your initial reaction be? Anyway, it seems like an interesting book. So, I jammed with the keys/drum guy and the other guitarist yesterday (Tuesday). I played bass. Not my instrument, but I want one. I certainly want a Jazz bass, probably a 5-string (not so I can really hit the low B, but more so I can play the E in a slightly more hand-friendly place. I'm getting better, but it's cool. But there is something missing. Keys, guitar, bass, no drums. And I'm the bass. Did I mention that the bit they were playing was in some odd time signature? 1-2-3 1-2-3 1-2-3 1-2 1-2. That's 13/4 or something, right? I was trying to find the one, trying to hook in. I think Peter Hook of New Order, playing long notes over the tight rhythm of the keys, drums and guitar. I think that style would really work with them. If I could just fine the One. 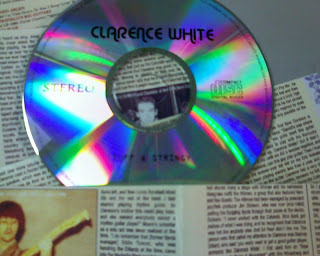 I'm a big fan of Clarence White. I hope nobody's too shocked by that. Anyway, I was at a local record shop last week. I found a recording I have been looking for. The Tuff & Stringy Sessions. 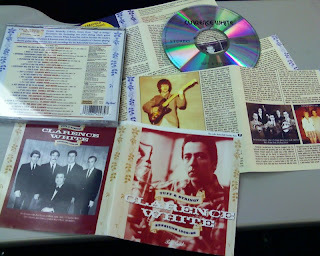 Once upon a time, Clarence was a flatpicker in a bluegrass band, but Dylan going electric and the Byrds doing Dylan had caused a folk bust, which killed the gigs for his kind of music. So he started to learn to play a Telecaster like Don Rich and James Burton, doing country sessions and playing clubs until a spot opened up for him in the Byrds. I own all the Byrds stuff I want, from Sweetheart of the Rodeo to Farther Along. I have a copy of Muleskinner, his one-off proto-newgrass outfit. I have the classic Kentucky Colonels albums. I have Nashville West, recorded at one of the aforementioned club gigs. But I had none of that post-Colonels, pre-Byrds session work. I had seen it on Amazon and other websites, but I hadn't had a copy in arm's reach before, and I felt I could not delay, I could not refuse. So I bought it. And as soon as I opened it, I thought something was up. First of all, as you can see, the liner notes are not stapled. They are on thick enough paper that it is difficult to fold it and put it into the case. And they are not printed in order. I'm one of those big geeks, and part of the reason big music geeks get physical media is so they can read the liners. It is quite difficult to read the liners if you cannot actually find the order the liners should go. It is also difficult to read the liners if they are printed poorly. Previous non-Legacy releases may have been a wasted opportunities, but I've never seen them poorly reproduced until now. And there's usually some font and layout continuity between the packaging and the CD itself. The music itself seems OK, but digital-to-digital copying should not cause much degradation. One of the benefits of CDs, and one of the problems for the music industry. For me, this one's a special thing. Because I want as much benefit as possible to folks who release CW material, so as much CW material as possible gets released. There might've found things I have found before where the copyright holders received just as much nothing as they got from this, if I am right and this is a bootleg. Anybody know? Anybody here have this already? Listen to the first part of this. Which is Adam Gussow schooling us on Sonny Boy Williamson. Then listen to the beginning of this. You don't actually have to get more than ten seconds into it. Just the "Down Down Baby, Yo' Street in a Range Rover" part. Nelly's rockin' the signature riff to "Pontiac Blues". Rockin' a different set of wheels, to be sure, but it's the same riff. Nothin' new under the sun, I guess. That's a lot of years. Let's do the same again, and many more! I was in line for the porta-potty, and the guy in front of me was saying that the Fiddler's Gathering wasn't just a bluegrass festival "this time". I went on about how I've never known it to be that narrowly defined musically, and I told him about seeing Claude 'Fiddler' Williams. Except I couldn't remember that name. He's the Father of Information Theory. I lose track between great fiddlers and great computer scientists. Welcome to my mind. This will be a bit random. I have left too much unsaid. Tonight was pretty interesting. The lead guitarist was sick, so it was all on me. The drummer was back, so Keys-to-Drummer was back on keys. The power supply on the synth was gone, so he was on the grand piano. This meant he underplayed, because the weighted keys are tough on the hands. He thought he did poorly, and once he kinda got lost, but I only gave him grief because, with the other guitarist gone, it was my job to give people grief. He did well, he sounded good, and I enjoyed myself. And my wife said I played pretty. I'm playing hybrid picking, which in my case is pick and middle finger fingernail. So I'm trying to figure out how to keep my nails in good condition. MusicThing has a compendium of links on that subject. Already, my fingernails are working better. Which actually is getting in the way of my typing, but you do what you must. Also from MS, silver cast replica knobs for your instruments. As I told Pribek, my local area has a folk festival. Except it ain't folk. It's called The Fiddler's Gathering, and it has the violin as it's raison d'etre. I don't think I've seen classical music there, but just about anything else where you'd expect to hear a fiddle on is fair game. Including jazz. In the past, I have seen Johnny Frigo and Claude Williams at this festival before. Great players, but very old guys. This weekend, I saw Aaron Weinstein. I saw him at the festival before, about 10 years ago, when he was on the open stage. Now he's graduated from Berkelee and swinging like a pendulum. Catch him if you can. I knew I'd really dig him. What I didn't know was that I'd really dig another act. Out of New York, they call themselves Spondoolix. Cello, guitar, fiddle and vox, and fifes and pipes. Might I say that Uilleann Pipes rock? Anyway, the star in my mind is Mazz Swift, the fiddle/vox person. You don't often see a black lady with dreadlocks playing traditional celtic music. And of course she did it well, or else I wouldn't be writing this up. (If I had a digital camera and I didn't have a wife, I might put up a picture of her in her digital skull-and-crossbones t-shirt, which was way cool.) The coolness to me is that, in all the celtic singing I've heard, there's an edge to it, a harshness. And she really doesn't, so it forces you to listen harder. Lovely, lovely music. Back to the gathering: Some famous festivals have instrument competitions. I'm thinking the flatpicking competition at Winfield, but there are others. I have a bit of a problem with the idea of competition in that way. I couldn't say that Mazz was better than Aaron, or either was better than Sammy of the Foghorn Stringband. How do you compare swing violin to oldtime fiddle? I wore shorts. I didn't wear anything to protect me from the sun. And Sunday morning, I had a burn on my right knee that felt like a bruise. Rock the SPF, dudes. And, as it is a fiddler's festival, I pulled out one of my two. I'm a guitarist. I'm a mandolin player. I'm a fiddle owner. But I still want to play with the stuff. And in preparation, I went to the Sam Ash that's (nowhere near) on my way home from work, and I saw a Fishman pickup for fiddle that clips to the fiddle bridge and cost $100. I'm curious as to the volume level from that, whether I could fiddle through my wah and AX1500G or whether I must pick up a Para DI, too. Anyone play that four-stringed beast?